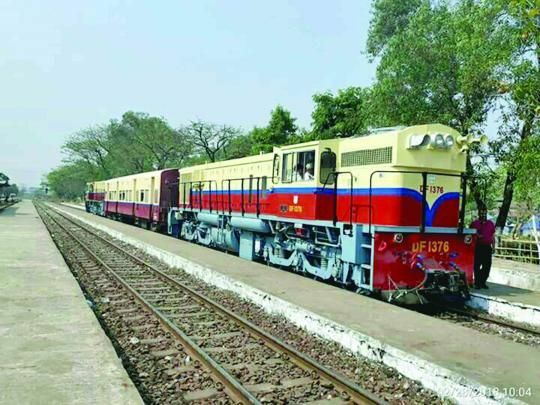 The Indian government�s engineering consultancy company RITES Ltd. handed over the final batch of six YDM-4 diesel-electric locomotives to Myanma Railways during a ceremony in Nay Pyi Taw yesterday. Also present at the ceremony were Uni0n Minister of Transport and Communications U Thant Sin Maung, Indian Minister of State for Railways Rajen Gohain, deputy ministers U Kyaw Myo and U Tar Oo, Indian Ambassador to Myanmar Vikram Misri, Technical Director of RITES Ltd. Mukesh Rathore, and other officials from the Ministry of Transport and Communications. U Thant Sin Maung mentioned 18 locomotives were purchased with loans procured from India�s EXIM Bank. He thanked the Indian government, EXIM Bank and RITES Ltd. for aiding in the development of Myanmar�s railways. Next, Mr. Rajen Gohain and Indian Ambassador Mr. Vikram Misri delivering the opening speeches. Next, General Manager of Myanma Railways U Min Aung and Mukesh Rathore explained the mechanics of the locomotives. Mukesh Rathore then handed over the documents for the locomotives to the Managing Director of Myanma Railways U Thurein Win. The officials then sprinkled ceremonial water on the locomotives. The new YDM-4 locomotives have a microprocessor-based control, The location of the locomotives, their travelling speed and status can be monitored with software downloaded from the factory. In addition to this, the control unit can be linked with a laptop to keep track of the locomotive�s status. YANGON, May 17 (Xinhua) -- The state-run Myanmar Railways (MR) will sign deal with tender winners for a Yangon railway development project in two months to start the project, the official Global New Light of Myanmar reported Thursday. A three-company consortium consisting of a local firm Min Dhama Co. Ltd, Singapore-based Oxley Holdings Limited and China-based Sino Great Wall Company were opted in February as the tender winners to re-develop the prime site around the Yangon Central Railway Station. MR invited tenders for the Yangon Central Railway Comprehensive Development project worth 2.5 billion U.S. dollars for the second time in 2015 after an initial attempt in 2014, which was cancelled for the lack of suitable applications. The project will signify the country's prospective largest joint venture investment project during the incumbent government and it is estimated to last for eight years, creating over 100,000 job opportunities. Under a plan of massive transformation of the railway station into one of the city's most sparkling new projects, the Myanmar authorities were inviting ideas and expression of interest from local and international investors to undertake design-and-build work for the comprehensive development of the 130-year-old railway station in accordance with international rules and regulations. Railways authorities are planning to install a modernized train monitoring system (TMS) in Yangon-Mandalay railway using a loan from official development assistance (ODA) from Japan, according to Ministry of Transportation and Communications. �We planned one billion Yen for the TMS to modernize Yangon-Mandalay railway,� said an official from the ministry. The Japanese International Cooperation Agency (JICA) will provide US$270.64 billion to upgrade the railway under a five-year plan. The railway is 385.5 miles in length and six express trains, two postal trains and four other trains running between Yangon and Nay Pyi Taw will operate on it. �The ministry has to supervise tender selection process to avoid wrong steps since 2017. We will have to submit it to the ministry. Now we are planning to sign an agreement. The project is expected to start in July,� he said. Myanma Railways will use two out of eighteen new locomotives bought from India in Yangon-Mandalay railway. India agreed to loan more than US$200 million to Myanmar to buy new locomotives and to maintain infrastructures. Japan�s Hello Communications has submitted a proposal to upgrade train stations along the Yangon Circular Railway to Myanma Railways, which operates the line, U Arkar Min Thu, general manager of the economic department under Myanma Railways, told The Myanmar Times on Tuesday. It is the first time Myanma Railways is receiving proposals from the private sector for upgrading works along the railway. Through its local joint venture, Hello Communications will commence work on Thamine station in Mayangone township, which will be conducted as an initial test project, after which the government will decide on whether to issue a permit allowing the Japanese to upgrade all 37 stations, said U Arkar Min Thu. However, a timeline for the work to be carried out and completed was not given. �We presented our plan for the Yangon Circular Railway in April for all 37 stations but received instructions that we should upgrade Thamine station first,� said Kimio Shichida, chair of Hello Communications. Based on the company�s estimates, all 37 stations will require an investment of about $11 million. Work on Thamine will begin this year after the permit is received and an agreement for the long term lease of the station from the Ministry of Rail Transportation is signed, said Mr Shichida. The upgrading of Thamine station will include construction of a new platform, train station and staff quarters. Hello Communications estimates that construction of the staff quarters alone will cost around $300,000. �We will also be responsible for the long term maintenance of the housing after construction,� said Mr Shichida. 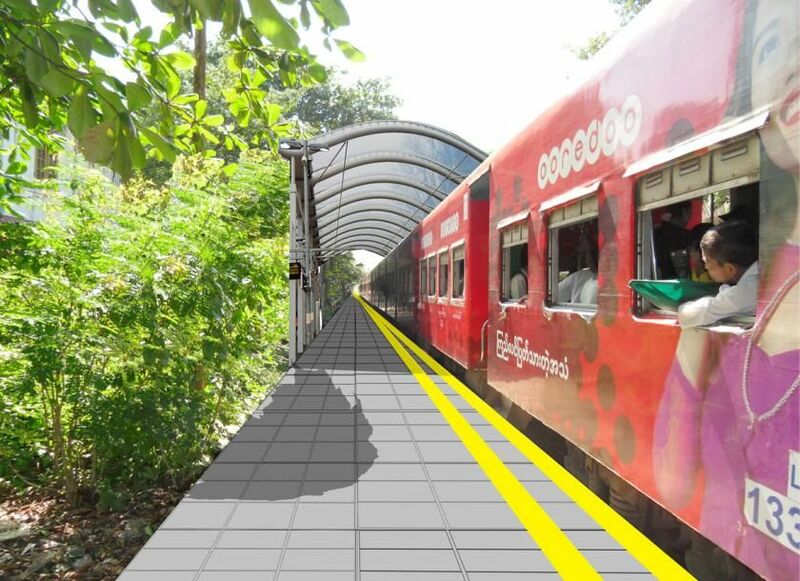 The new Thamine platform will include construction of a ticket office, entrance gate, shelters and public amenities. It will also come with a modern coffee shop, convenience stores and advertising space to generate revenue. Hello Communications� working relationship with the railway operator in 2016, when it received a permit to run advertisements on a total of 188 pillars at the Pansodan flyover bridge leading to the Yangon Central Railway Station. However, that business was not a success. The company has also constructed a coffee shop and seats for commuters at the Yangon Central Railway Station. Train monitoring system (TMS) will be carried out in Yangon-Mandalay railway using a loan from official development assistance (ODA) from Japan, according to Ministry of Transportation and Communications. �We planned to use one billion Yen for the TMS to modernize Yangon-Mandalay railway,� said an official from the ministry. It will be a 5 year project from 2018 to 2023 with the cooperation from Japanese International Cooperation Agency (JICA) and will use US $ 270.64 billion in upgrading the railway. The Ministry bought 18 locomotives from India and among them two locomotives bought from India will be used in Yangon-Mandalay upgrading section. �The ministry has to supervise tender selection process to avoid missteps since 2017. We will have to submit it to the ministry. Now we are planning to sign an agreement. The project is expected to start in July,� he said. Myanmar has borrowed US$ 200 million from India in order to buy locomotives and to maintain basic infrastructures of Myanmar Railways as part of the cooperation between Myanmar and India�s railway sectors.